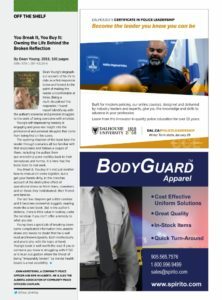 My book You Break It, You Buy It: Owning the Life Behind the Broken Reflection was reviewed by AACPO Chaplain John Armstrong, and was published in February’s edition of Blue Line Magazine, Canada’s National Law Enforcement Magazine. Click HERE to view the review in the electronic edition of Blue Line Magazine. Interested in purchasing a copy of the book? Click on the Publications tab above!